I hope 2019 has gotten off to the start you were hoping for! (Are you tired of hearing about the new year yet?) Things at the Crochetpreneur studio are rocking already! While I made a resolution not to give in to the overwhelm, I’m still struggling to find time to just relax and be present when I’m not working…I guess that comes with the territory when you LOVE what you do! The baby is napping right now after an extraordinarily fussy morning…so I’m already running on 3 cups of coffee…how do you handle the stress when it seems everything is out of control? Anyway, before I put my feet up for a few minutes, I wanted to pop in and share just a couple of things with you. First, you may be asking why I’m sharing such intimate detail so of my business with you. 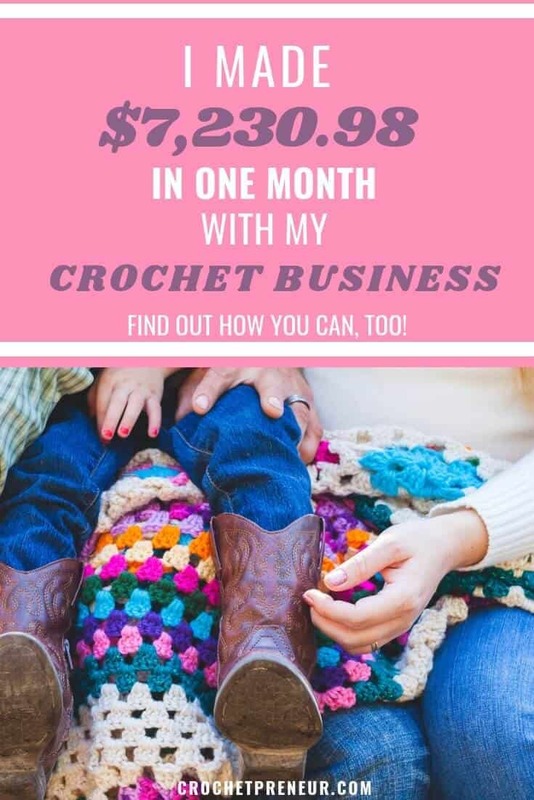 Well, first, I’ve found that when others have shared their income reports, I’ve been so encouraged to believe that it IS possible for this regular, work-at-home grandma to enjoy the personal and financial freedom that comes from having a successful crochet business. And I hope to inspire you in the same way. If you’ve been reading for any length of time, you’ll know that I’m a passionate advocate for multiple streams of income – the cornerstone of which is starting a blog. From that, all the rest of the income opportunities flow. Secondly, the reason I share these details is you. I feel like I need to be accountable to you and show you that I’m not just telling you what I think will work, but what does work for me and, sometimes, what doesn’t. That’s right, when I hit the inevitable struggles, I’ll share those with you, too. I think it’s important that, as someone sharing business tips with you, I’m open with the numbers. Really, anyone can share their ideas on how to grow a business and I want you to make wise decisions about who you’re following. Am I the most successful blogger/designer/maker out there? Nope. But I’m growing my business right alongside you and I want to be as transparent about that as possible. Ultimately, on those days (weeks and months) when this blogging thing, this crochet thing, this maker thing feels HARD (and sometimes it IS hard – please don’t set yourself up for disappointment by believing otherwise), I hope you can come here and find some inspiration to know that you can push through the hard days and build a business you love. 1.3 NOT INTERESTED IN BLOGGING? Well, that was a nice month! Did you notice, though, that it was less than half the profit I made last month? I told you things were going to take a downturn after November. That’s just the normal flow of things in our business…it was closer to Christmas so more people were finished with their shopping. Plus, I only did one craft fair instead of three. So, these results are about what I expected. I might have made more money in advertising income if I had posts more on the blog in December but, honestly, I was pretty burned out after the 30 Days of Cozy campaign in November and needed some time to just relax and enjoy the holidays. So, it was a trade-off I chose to make. Now, speaking of the blog, let’s take a look at the traffic from December 2018. Again, this is about what I had expected after the craziness of post a new free pattern every day in November. I’m happy with these numbers and they’re, actually, a tad higher than I had expected. So, that’s nice! My goal for 2019 is to get my page views up over the 100K mark. How I’ll make that happen, mmmm, I’m not sure but I’ll work up a plan and let you know! If you’re one of those go-getter crocheters who knows that you want to be more than a hobby seller, I’d love to invite you to join us in the Crochetpreneur MasterClass. While the class isn’t enrolling right now, doors open on April 15th and you can be sure to get in on the action by signing up for the waitlist. Already have a blog, but looking to increase your income, check out this free resource from Elite Blog Academy, 7 Surefire Ways to Boost Your Blog Income Overnight. Other ideas? Take my free ROCK YOUR CRAFT FAIR Training Series for those interested in selling product locally and, for aspiring designers, sign up for the GET IT DONE Concept-to-Launch Crochet Pattern Writing Email Challenge!